We've lost track of how many special edition Chevrolet Silverado and GMC Sierra pickups there have been over the past few years. But while some special editions can be kitschy, there's nothing overtly bad about the GMC's Nightfall line. We've already seen the blacked-out look on Canyon Nightfall and Sierra All Terrain X pickups, and now, it's being applied to the Terrain. As with the trucks, the Terrain Nightfall's changes are simple: the chrome-heavy finish is replaced with gloss-black accents where applicable. That's what you'll find on the grille surround, the front and rear fascia accents, the license-plate surround, mirror caps, and roof rack. Like Jay Z said, all black everything. Except for the wheels, of course – those have machined faces with black spokes. The grille inserts aren't strictly black either (they're charcoal), and as counterintuitive as it may seem, owners can choose from three body paints in addition to Onyx Black (Summit White, Graphite Gray, and Crimson Red). The Terrain Nightfall Edition will be offered on the SLE-2 and SLT trims, with prices to be announced closer to its fall 2016 on-sale date. It joins the Canyon Nightfall Edition and the all-new Sierra All Terrain X as the latest GMC vehicle to offer an exclusive, personalized appearance with the Terrain's premium features and refinement. "Building on its best year ever, Terrain continues to attract new and style-conscious customers to GMC," said Duncan Aldred, vice president of GMC Sales and Marketing. "The new Terrain Nightfall Edition adds another great-looking and well-equipped choice for this popular SUV – one that will stand out in a crowd." 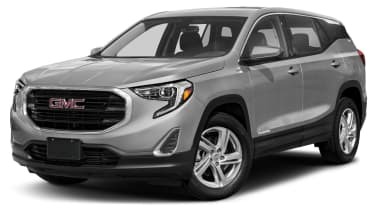 GMC IntelliLink with a 7-inch-diagonal color touchscreen is standard on the Terrain Nightfall Edition's SLE-2 and SLT trims, along with available 4G LTE connectivity and Wi-Fi hotspot. • About 50 percent of Terrain customers are women – GMC's highest rate of female buyers.